It’s no question the Miami Heat stumbled out of the gate at their season debut in Boston. Though LeBron James showed up scoring 31 points, the other two-thirds of the Big 3 struggled to keep up, with Dwayne Wade scoring 13 points and Chris Bosh tossing eight through the basket. Boston fans shouted “overrated” when LeBron took the court, cheering the Celtics to a 88-80 victory. Before the season opener, the Heat were commanding record breaking prices on the secondary ticket market, driving up averages across the entire league. However, as fans are beginning to realize it’s going to take some time for the Big 3 to hash out their strategies and play as one driving force on the same court. 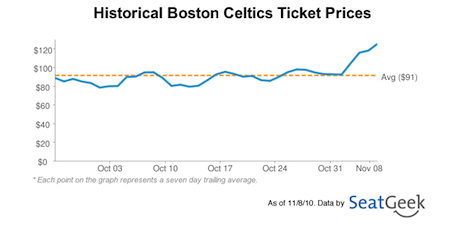 Fans paid an average of $370 for the October 26th Celtics opener in Boston while the current going average for the rematch in Miami on Thursday is $211. Is a sharp decline in Heat prices on the secondary ticket market indicative of fan sentiment? An initial look shows that the hype has boiled over – are the Big 3 attracting fair weather fans? Prices have jumped for the big Celtics rematch in Miami Thursday night, and have stayed high even after last night’s loss to the Jazz. In the end, only the scoreboard will tell if the King and his knights can reign supreme. Do you think the Heat are overhyped? Let us know in the comments or on Twitter @SeatGeek.